Black and white negative showing a street fair parade through downtown Whitby in 1936. 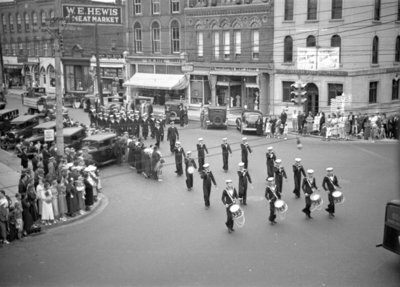 The Sea Cadet Band is crossing the intersection of Brock and Dundas Streets. People are visible lining both sides of the street. View from the upper floor of the post office at the corner of Dundas and Brock Streets. Whitby Street Fair Parade, 1937, Marjorie G. Ruddy. Whitby Archives, 30-006-014.